As David Robinson explains in his introductory post, the Stacklite dataset is designed to be easy to read and analysed with any programming language or statistical tool. A fantastic resource if you are a data analyst/scientist and want to crunch some real data! What are the most popular tags? How many questions have more than one tag? What is the overall closure rate for the site and which tags present higher values? How much time it takes, on average, to close a question? Which tags tend to have higher/lower score? And in particular: how data science languages perform on the above questions? Analyzing the Stacklite dataset is a great occasion to practice the dplyr library for data manipulation. And also familiarize with the pipe %>% concept, which lets you express multiple complex operations in a way that is clear to read and understand. As I mentioned, the dataset includes questions since 2008 and is pretty huge...due to memory reasons I have answered most question using a subset of the data, containing only this year data (Jan-Aug 2016), but of course you could replicate the analysis on the whole dataset. Enough with the introduction. Let show some code and results. "questions.csv.gz": containing all the info about questions except for tags used. "question_tags.csv.gz": which associates each question ID with its correspondent tag(s). Both datasets are pretty huge: 15 millions of rows the first and 46 millions the second. I am going to create a subset with only questions created in 2016, which I will use to perform most of the analysis. And then, very important, I will merge it with the "question_tags" dataset using the Id variable, in order to be able to relate tags with other question variables. Let also load the dplyr library and lubridate to work with dates. Ok, let start enjoying the dplyr package. Here I am going to sort tags by number of questions they were categorize in. And also calculate their % share over the total number of questions made. 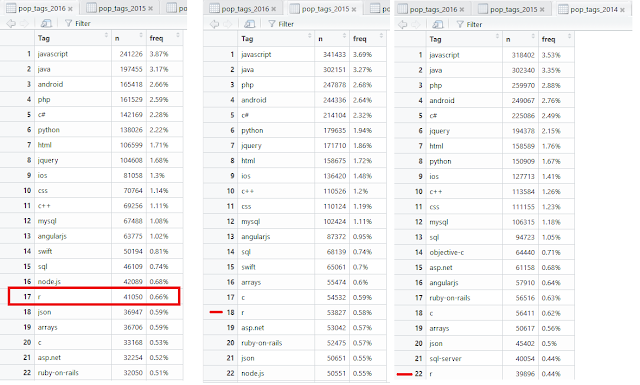 Notice in the image above that I've also generated a data frame with popular tags for 2014 and 2015 to be able to make a comparison. On the other hand, we can notice that the tags share is quite fragmented: the 10 top tags generate just over 20%o of total questions. This is expectable given the possibility for the user to place any tag they like. 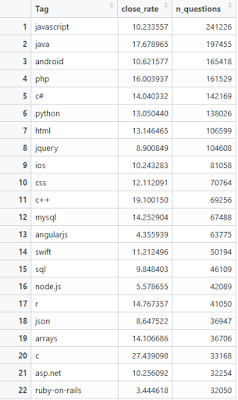 R is at 17th place in 2016 with 41050 questions. Notice as in 2014 it was at position 22. Pretty good result! 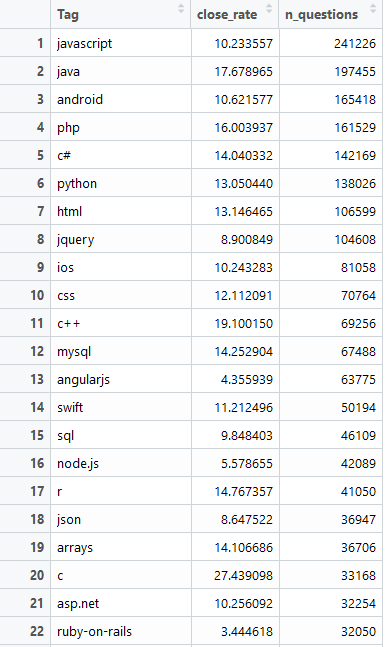 It´s interesting to see how data science languages perform. In the code below I create a vector containing some of the most used languages in data science, and later use this vector to filter the data frame of popular tags. Using the pipes I also add some ggplot code to create a bar chart. 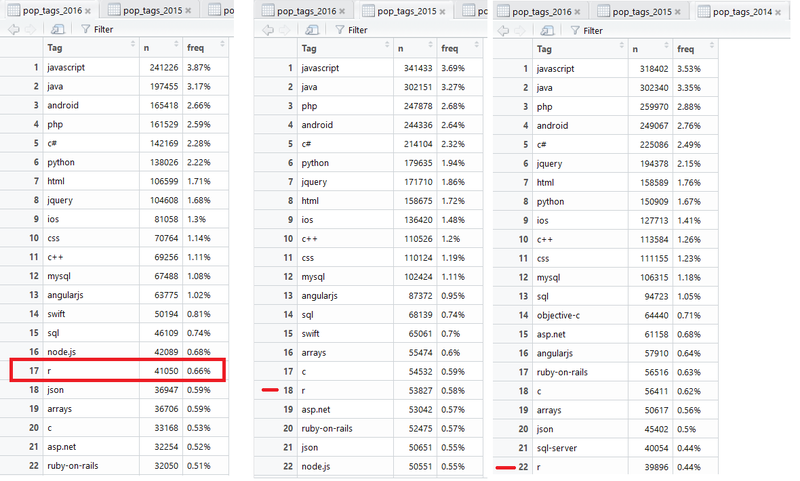 Python stands out with a much much higher % share than other languages, though of course it's a broader language used for server-side web applications. Here I first need to count the number of distinct tags for each question ID. With the resulting data frame I can analyse the tags distribution with a simple histogram. Let me do a sanity check searching for the first question ID of the resulting data frame on Stack Overflow website. Cool, last January Wayne asked a question bout flashlight in Android and he did use 5 tags. 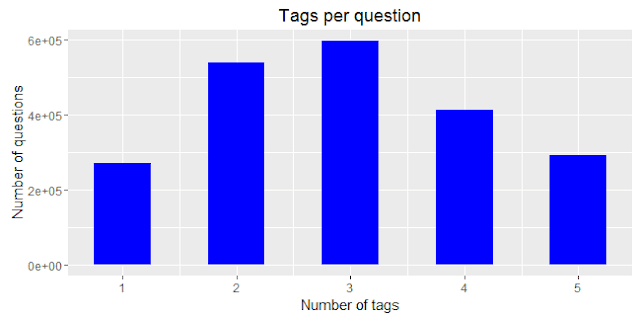 By plotting an histogram you can see that most questions in 2016 had 3 or 2 tags. Of course at least one tag is mandatory and I guess there is a maximum of 5 tags allowed per question. There are more questions with 5 tags than questions with only 1 tag. Finally, to answer my original question: how many questions had more than one tag? We can see below, that on over more than 2 millions questions made in 2016, about 87% of them had been categorized with more than one tag. What is the overall closure rate for the site and which tags have the highest rate? To calculate the overall website closure rate is easy. Just use the original "questions_2016" dataset and count how many questions have the field "Closed Date" populated. Over 10% of questions made in 2016 have been closed so far. With a few dplyr commands and the code above, we can get the closure rate by tag. Note that I keep the tags sorted by number of questions. Ok, what about closure rate for data science questions? Which data science language questions are "more likely" to be closed? To answer this, I need back both the "questions_2016" and "question_tags" datasets. That is, I need the merged dataset and filter it by the data science languages vector. 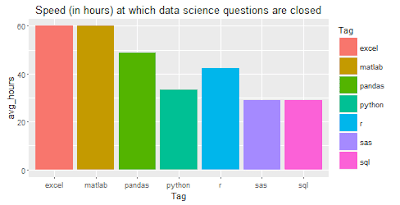 Apparently Matlab questions have the highest closure rate among data science languages. R follows with with nearly 15% of questions closed this year. 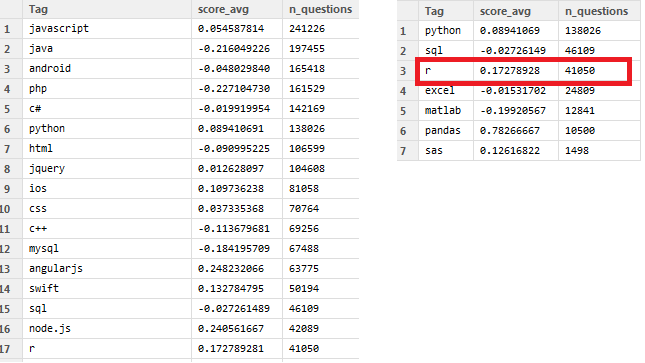 See the good performance (I assume a low closure rate is an indicator of relevant and good quality question) of Excel, Pandas and SAS, And also SQL, given the high amount of questions made. What we can do is also get the speed at which data science questions are closed. In the following code I compute the average hours needed for each tag and plot it in a bar chart. 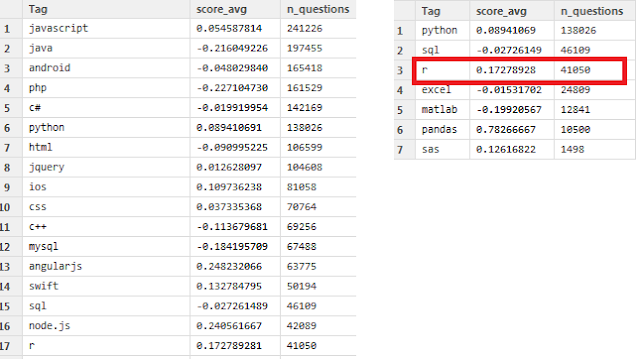 Personally I expected higher average values for the score variable; it looks as there is a general tendency to don´t score questions (and on a lesser extent to downvote). R questions however, on average show a positive score. I am just curious: which was the R question with the highest grade in 2016 (so far)? Quite a technical question... curious what was about? Find out here. how much the above indicators (number of questions, tags, closure rate, score,etc) changed over time. Ideally yearly/monthly since 2008.
number of answer or response rate by tag. tags association: which tags are most likely to be placed together in the same question? Some kind of basket analysis. which tags tend to be asked on working days vs weekends or on working hours vs night, etc.